Camprene is an oceanfront cottage overlooking Stonington’s working waterfront. This precious family cottage is perched on the rugged coast line and gives the feeling that you are on a boat. Camprene has amazing views and is comfortably equipped making this little cottage a sweet retreat. Camprene has one bedroom, a three- quarter bathroom and a small kitchen. In the kitchen there is an electric range, a refrigerator, dishes and basic cookware, a kuerig, and a microwave. There is a dining nook for two and a love seat couch which also converts into a twin sleeper. The three quarter bathroom was just recently outfitted with a new shower. There is also a small bedroom with a full bed and dresser. One of the most glorious features of Camprene is the large oceanfront deck which now boasts a new gas grill. Watch the working waterfront in full action as sailboats, lobster vessels, pleasure boats and many other vessels work around the many islands that are speckled all around Stonington’s coastline. There is also easy access to launch your kayak just feet from the cottage. If you are looking for a simple, in-town cottage with great ocean frontage then look no further Camprene is just the place for you. Reserve your time in the cottage today. 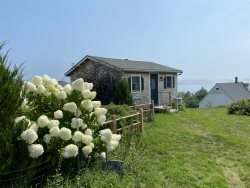 Camprene is a fully equipped little cottage sitting on pylons over the harbor in Stonington. And I really mean fully equipped-everything from an extension cord for the CPAP to spare light bulbs. In addition to the Keurig, there was a regular coffee maker for the locally roasted, complimentary 44 North coffee awaiting us on the table. There are panoramic views of the working harbor and off-shore islands affording one the chance to see the "real" working Maine coast. Shops and restaurants are within walking distance as is a pretty decent market which opens at 3:30 AM. I love Camden and Portland, but Stonington is the real Maine. And Camprene was perfect.